Jurassic World: Fallen Kingdom Teaser Trailer Run | Nerd Much? We shall see how durable the hamster balls really are. In this new teaser trailer for Jurassic World: Fallen Kingdom, we see stars Chris Pratt as Owen Grady, Bryce Dallas Howard as Claire Dearing, and Justice Smith in an as yet unknown role. Grady is running full tilt from a forested area that seems to exploding and on fire. The dinosaurs are following him out, far more concerned with their own survival than whether or not they want to eat the nearby humans. Though the roster of dinosaurs that appear here are mostly herbivores (including my all-time favorite, the Ankylosaurus), raptors do make the cut – likely due to Grady’s involvement. Dearing and Smith are there to receive Grady, looking on in horror before actually running and hiding behind one of the hamster balls we saw in a previous trailer. We shall see how durable they really are in the film, but for the length of the teaser it seems to hold up fairly well against a herd of panicked dinosaurs. We don’t get to see anything more, however, as this is a teaser announcing that a the full trailer will be coming this Friday. It will be exciting to see exactly what the dinosaurs are running away from, whether it is some kind of slow-acting bomb or a much larger creature than we’ve ever seen before. Rumors are abound as to what the explosion really is, some saying that it’s a volcano – which would make the most sense for this teaser. Jurassic World: Fallen Kingdom is directed by J.A. Bayona, known for his work on A Monster Calls and The Orphanage. Bayona is working with a script written by the first film’s director, Colin Trevorrow, and Derek Connolly (Kong: Skull Island). 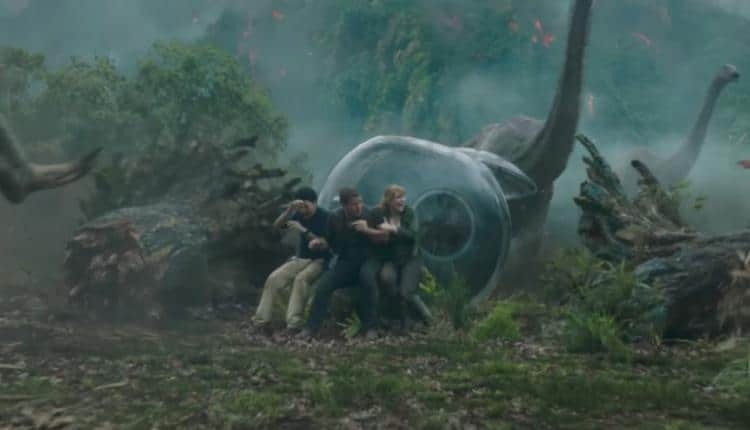 Trevorrow was quoted in a recent interview with Jurassic Outpost that Fallen Kingdom will be “more suspenseful and scary” than the previous film in the series. Other than the stars shown in this teaser, the film includes the much anticipated Jeff Goldblum in his role as Ian Malcolm, BD Wong as Dr. Henry Wu, and James Cromwell as Benjamin Lockwood. The film will be coming to theatres June 22, 2018.